What a wonderful film. I’m not going to beat around the bush, because there is no point and it’s a waste of space that’s better spent explaining why you should watch this right now. WALL•E is an incredible achievement that just makes me want to cheer that there is a studio like Pixar willing to take risks. In this day and age, that WALL•E can be created without prejudice, is just shy of a miracle. A charming, confident and ambitious love-letter to cinema that evokes the timeless joy of Chaplin, via 2001, E.T., Short Circuit and a splash of Star Wars. At heart it’s contemplative, serious sci-fi, but first and foremost, it’s for kids, and it knows how to have fun. So against a dark, dystopia future Earth (well it would be if anyone was there! ), is the cutest damn robot you’ll ever see, whizzing around tidying rubbish and finding treasures, while songs from “Hello Dolly” brighten up his day. Lonely, but for his indestructible cockroach friend, his world is turned upside down by the arrival of EVE. A robot listening to musicals and falling in love while sweeping up? 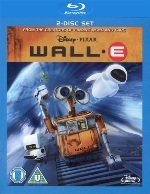 Hardly needs mentioning that like most of Pixar’s best characters, from the deluded Buzz Lightyear to the gently loopy Remy, WALL•E has issues and later in the story, he finds allies in a robotic mental asylum. He’s a rubbish collector, who dreams about the stars. And in one of the films most beautiful moments, he gets to touch them. It’s magical and that's even before the wonderfully delivered dancing sequence. Giving their lead characters no voice was a master-stroke on Pixar’s part, but just one of many within the gag filled 80-odd short minutes that this whizzes by in. Much as I love Chaplin, I wouldn’t want to go back to the silent days full-time of course, but still, dialogue is often a lazy crutch for film-makers. Even Pixar are fond of chatty characters and Disney don’t seem to have noticed they fell into a predictable and boring period of over-wrought cartoon musicals. Without a voice, WALL•E employs every visual trick in the book to win us over and he is a sublime creation. His R2-D2 style whistles (both characters courtesy of Ben Burtt) evoke everything you need to know. All the robots are well-done though. EVE is especially good in that her only expression is two blue lights for eyes. And I adore the tenacious little service droid, determined to clean-up every muddy tyre-track the disruptive invader leaves behind. Some say the film is let down and falls into lazy formula once WALL•E is onboard the ship with the fat humans. That’s not true; its deft balance of fun with substance is superb and committed throughout, and its always indulgent. The prat-fall gags are no more out-of-place than his playing with bits of rubbish (car alarm key fob. Genius!). The point is that WALL•E is a force of nature, ruining the routine of both the lazy humans and rigid robotics as soon as he sets foot on board the ship. The irony of him getting help from the insane robots shouldn’t be lost. That little service droid chasing after WALL•E almost steals the show, but despite being hilarious, the most important thing is, it got angry and became obsessed. The great BURN•E short on the DVD expands on this too, with another poor ‘bot trying to do his job. No, WALL•E’s adventures on the ship are far from lazy. I could defend it and say Pixar always have a chase sequence and hey, it’s a bloody kids film, what do you expect? It needs no such defence, because repeat viewings will prove it makes sense and that nothing was compromised. Obviously I quite liked this movie! I’m being more enthusiastic than usual because it’s represented poorly on this forum. Two other reviews at time of writing and both are grudgingly positive. Tom thought it was a pretty Blu-Ray demo disc and Rich said it was a toy advert! Consider the balance restored. Consider this potentially the best film of 2008, Dark Knights included. Where I do think it pulls punches is a slightly convenient, preachy plot that, and possibly a supreme act of confidence for Pixar would be no dialogue at all, but it’s easy to forget that WALL•E has an excellent sense of parody, so the rather more farcical elements have their place. The captain’s battle of wits with a HAL-like auto-pilot (complete with iconic 2001 theme!) is fantastic and one more mark suggesting that Andrew Stanton and Pixar’s creation is almost vulgar in how confidently far ahead of the rest of the field they are, including fleshy live actor counterparts. Sorry. That was an awful pun. I saw the trailer for Up and have upsolutely ( ) no idea where that will be going to... A must-see, of course. Consider this potentially the best film of 2008, Dark Knights included. I haven't seen Wall-E yet. I do like the Pixar movies I have seen, although I find something like Persepolis far more intriguing than the Pixar-style. Great review, though. I love WALL-E. It's a wonderful movie and one of the best of the 2008. I went to see it in the theater on opening day last year. I'm planning to do the same with Up...I love Pixar. One more for "I love WALL-E"! But, after watching it a dozen or more times with my niece and nephews , I'm not anxious to see it again for a while. You're lucky, my nephews made me watch everyday for a week when I was at my brother home The Chipmunk movie and Garfield. Now that is torture, less Gardfield but certainly not because of the film itself. Don't forget that we are french speaker, so it was worst since they were the french canadian dub version (and Garfield is sure annoying when the cat is dub by Patrick Huard). I do want to see Persopolis too, although I'm more interested in Waltz With Bashir. Both look like incredible pieces of work. It was a few days ago when I saw it and haven't been able to forget several moments. I'd happily watch it again right now! I'd draw the line at everyday though... kids, eh? Talking of my nephews my brother just send me a photo of them. They are twins and they will have 5 years old in july. I'm the godfather of Mister Smiley in the right of the photo. Do I need to say that I love them and my niece too, since I've no child myself. P.S : no problem with the hijacking of your review Jon? I didn't want to start a new topic. Just been watching some of the second disc and it's fascinating. I meant to mention before about the distinctive look and the unusual use of depth of field and zooms, unnecessary in animation of any kind and technically faults in live action, but makes it feel like a "film". I remember Joss Whedon using it in the CGI of Serenity too. Here, they had Roger Deakins come and teach them about traditional set lighting and how cameras moved and they programmed the animation to match the patterns of live action method. Very clever stuff. As Deakins says though, it's ironic that lens manufacturers have seen these quirks as artefacts since day one and are always trying to beat them. Of course we're now so used to them it works very well in Wall-e. There was also a feature on Ben Burtt and the sound design. Some wonderful clips of the classic Disney sound designers too and how he's still using the old methods where possible. Also, in my review I said they might have been even more pure and ambitious if the human characters couldn't speak. Well for a huge amount of time, the "humans" were going to be so de-evolved that they were lumps of jelly! Look hilarious, but to be honest, they were right to change it because there was no grounded focus point for the viewer. I finally watched it last night. What a beautiful film, and I don't only mean the visuals... There are a few things they have Wall-E and EVE do, little gestures and movements, that have the audience connect to them and almost forget they are "just" robots. I also felt that the humans on the space ship are sufficiently "smart" (for lack of a better word right now), as they don't react all stereotypical. I also enjoyed how they were actually quite eager to break out from the boredom; the lady and guy who don't just want to get back to TV and then hold hands for the first time as well as the captain. Also funny how the humans interact with the robots quite casually. In my opinion easily the best Pixar film yet. Toy Story only comes close for being so immensely ground breaking at the time.